If you provide us transfers that can be applied via heat press we will add them to your shirts on individual orders. We currently do not produce the tags but we will apply them if you send them to us. You can get transfers made at the following businesses: Transfer Express (they are kind of a pain in the you know what but the transfers are good). You want to ask for heat applied transfers with custom art. You can get them made wherever you want but please don’t do the print your own labels as those are terrible! Follow the steps below to get the tagless label branding service enabled for your products. Create a document that is 11.25 x 14.00 and add your labels spaced so there is room to cut the labels before we press them on. Save the file as a 200 DPI jpg file. Many add 12 labels per sheet (depending what size). See this guide to creating a gang sheet. You can make docs depending on Transfer Express and add more labels if you can fit them. How many and how large is up to you but most clients have labels between 2″-3″. 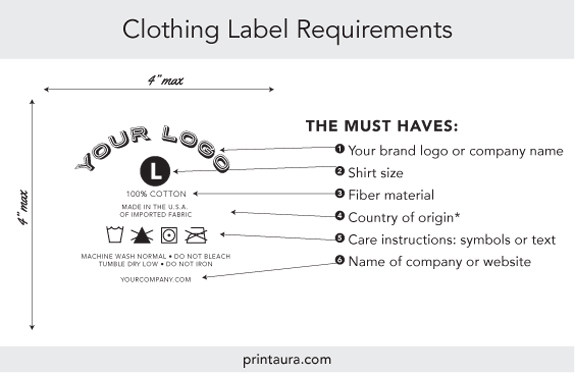 When designing your labels make sure to consider whether they will be used on light or dark garments or both and design accordingly. Make sure your labels meet legal requirements if you want the legal tag removed from your garment. You will need to “become a dealer” with Transfer Express before you can place an order. If you find a different company you would like to order your labels from, feel free to do so. Once you have an account and you have a hang tag designed, you can upload your art and place a custom order. Transfer Express requires is a minimum of 10 sheets when ordering custom t-shirt labels. The prices are roughly $10.53 per sheet for one a one color transfer. So for the minimum 10 sheets your cost is about $105.30 plus about $12 shipping. So you are looking at about $1.00 a tag and between tag removal and tag application another $1, so doing this type of branding costs about $2 per garment. If you want additional colors the prices go like: $18.14 per sheet for two colors, $25.72 a sheet for three colors and the price continues to go up for more colors.Please keep in mind that there are lots of companies who can create the labels for you so feel free to shop around. Make sure to select “Tag Removal” and “Apply Tag” when you make your orders and we will press on your labels to your orders. If you use an app or the API you can set the defaults for label application and removal at Your Brand. You will then be prompted to select the default location of the heat press labels. We can currently apply the labels to the following locations as seen in the image below. 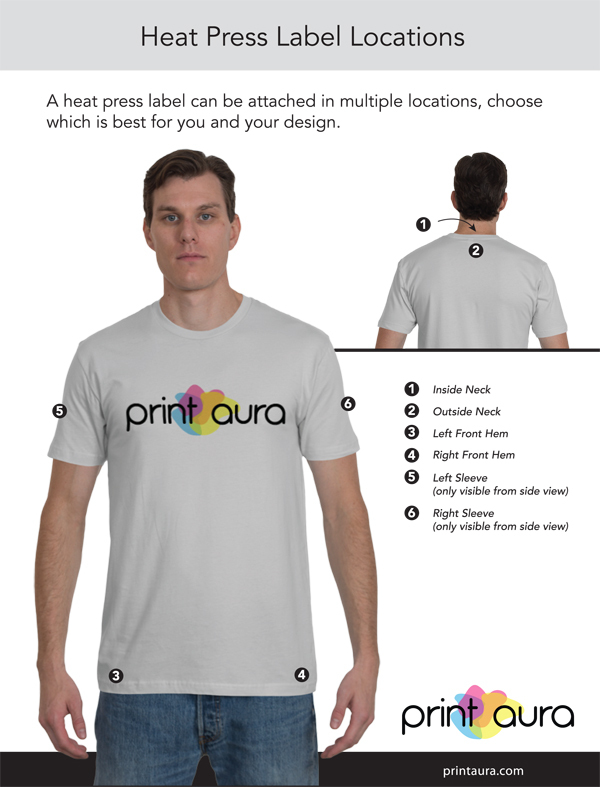 Make sure you are a Print Aura member. If you haven’t signed up, do so now!